Nothing screams the 80's more than an audio cassette tape! If you are looking for a bit of nostalgia, the novelty cassette tape gifts featured on this page may just do the trick. 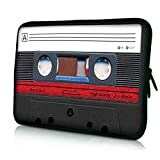 You will find retro cassette tape home decor, room decor, office supplies, jewelry, candy, iPhone cases, watches, pillows, tape dispensers, laptop sleeves, notebook sleeves, messenger bags and more on this page. If you are hosting a retro theme celebration, there are also 80's Party Supplies featured here which includes plates, cups, balloons, decorations and table centerpieces. This cassette tape pillow from DCI was item I came across that inspired me to create this retro page. The cassette tape pillow is so realistic and would make a fabulous room accent to your family room, game room or media room. Pillow is 100% polyester and measures 18" x 10" and features a funky 3D look. 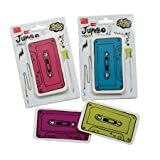 These retro cassette tape cases can even be customized with your favorite 80's band, album or song! You can head back to school in retro style with these fun cassette tape school supplies. The first item is a zippered cassette pencil case which measures approximately 8" x 4" and is made of neoprene fabric. It features a vibrant color print that will not fade. 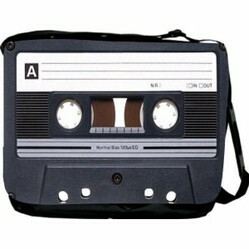 The next school accessory is the cassette tape messenger bag. This messenger bag is sure to make a statement. It is not only super cool, but roomy, too! It has plenty of space to store all of your school pencils, textbooks, notebooks and more. The last item are the neon colored cassette erasers. They would look great in your cassette tape pencil case. You can also purchase retro cassette tape office supplies. These unique supplies would also be great for home or school. The first is the cassette tape memo board. This novelty memo board features a glass surface for writing notes and measures 14" x 9". It is easy to mount to any wall and comes with a dry erase pen. The last item is the cassette tape dispensers. These novelty tape dispensers are constructed of quality, durable rubber and are available in green, orange and red. You will be amazed at how many cassette tape jewelry accessories there are on the market. Some of the cassette tape jewelry includes cufflinks, natural wood necklaces, gold plated earrings, pendant necklaces, bracelets and more. There are also cassette tape inspired watches. These watches from EOS New York are available in gold, blue, black and silver. How unique a very nice retro gift which is so trendy. Love it!